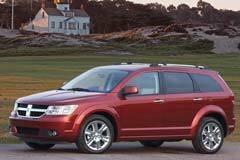 If you would like to buy a nice sized crossover SUV, then a used Dodge Journey may be just the right option for you. The Journey is a mid-sized five-door SUV that was launched in the market back in 2009. In 2011 an updated version of the Dodge Journey was introduced. This featured a number of modifications. There were aesthetic differences such as in the lower front fascia, a modified grill and revisions in the interior. There were also some modifications to the steering, suspension and the power train. The Dodge Journey comes with a platform that is very similar to that of another popular model from this brand - the Dodge Avenger. The Dodge Journey was manufactured with a four-cylinder engine and there are several transmission options, both in manual and automatic. It is important to check this out if you are going to buy a used Dodge Journey as inevitably the performance depends a great deal on the engine you opt for. 2017 Dodge Journey GT AWD Like-new, 4-K miles, one owner, loaded, 3rd row seats, remote start, warranty!